Since my wanderings back when the world was safer through several of the islands of Indonesia, I've had a soft spot for this amazing place, its people, its tastes and sounds. Too little of its music emerges internationally, however (though you can find some tasty old treats at Madrotter). So it's always a delight when something new comes along. 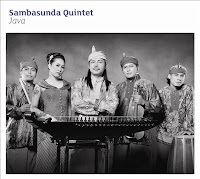 And the just-released album Java from Sambasunda Quintet is full of Javanese goodness. The album has a more traditional flavor than some of their past work. The music is centred upon the ensemble’s sensitive use of the kacapi, a boat-shaped zither which has been heard in the honeyed, mellifluous music of Sunda (West Java) for centuries. In addition to the sounds of haunting kacapis, female vocals, violin, suling (bamboo flute), and khendang and kulenter drums are also heard. Although the instrumentation is traditional the music is performed with a distinctly urban rhythmic accent, reflecting influences of local and international pop music prevalent in West Java’s thriving capital city, Bandung. If you've been leery of Javanese music in the past (too much shadow-puppet music? ), I can assure you that this is on a different wavelength. Rooted in tradition, it nonetheless evokes less clashing of tin and more the pleasant evening ambiance of an intimate club. If you and your friends have become jaded from the sounds of the same old Ethiopian jazz, this is a great next step. Singer Neng Dini Andriati has a tremendous voice, and the instruments are both played and recorded with great skill as they wend through a variety of updated traditional songs, originals, an Irish-Javanese mashup, even a song based on the tune "Sailing Home" by Sabah Habas Mustapha. Talk about music coming full circle! My favorite song on the album may be "Kembang Tanjung," but I'm going to give you a listen to another tune based on its interesting vocal harmonies and easier-to-dance-to rhythm. [mp3] Sambasunda Quintet: "Jaleuleu Ja"
Sambasunda are currently on tour in the UK.